5th March 2009. Sport your ExplorOz Sticker with Pride, Time for Parks Passes, Great deals on GPS Units, Camps 5 Launch, and a new Trek - Darling River Run. 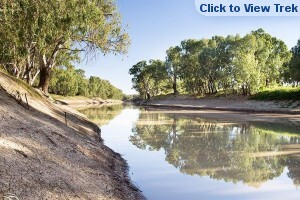 The outback travel season will soon be upon us but with recent widespread flooding through the outback it will be particularly important for early season travellers to have plenty of maps onboard to navigate your way around any unexpected roadblocks. The ExplorOz Shop is well stocked with the popular Hema Atlas and Guides and with 9 titles this set covers just about every idyllic camp destination. 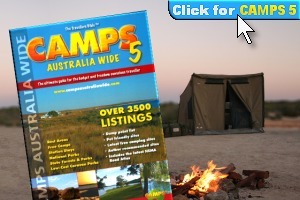 We are agents for all WA CALM passes needed for entry into National Parks and the SA Desert Parks Pass needed for a crossing of the Simpson Desert and although you can buy thesepark passes from us online we do advise getting them well in advance as they contain important information that you'll find useful for planning your trip. We also have some great deals on GPS, Garmin Colorado and Oregon models but hurry as these prices won’t last. Keeping up with book titles is a never-ending process so we've decided to put it over to you to tell us what books you'd like ExplorOz to offer from our Shop. We've put up a post in the Forum for you to discuss some ideas and have your say. To view the post click here. ExplorOz Trips and Gatherings are the perfect place to meet new people with similar interests but its also designed to encourage new Members to join ExplorOz. Whilst Membership is not compulsory we do ask you to show your support for the features you enjoy - whatever they may be, with Membership. Organisers - did you know that we have a couple of large banners emblazoned with the ExplorOz logo that you can borrow for these events? Just ask and we will despatch one to you. We also have a number of items you can re-order (at no charge) anytime, such as bumper stickers and promo cards. Just adjust the quantity value in the shopping cart for the number you want. We had a bad batch of round bumper stickers a few months ago - if you were one of the unlucky ones and your sticker has faded this problem has been solved and we'd love the opportunity to send you a new one. The new ones are not round - but horizontal and include our motif "There's more to Explore". ExplorOz window stickers are spotted everywhere and look great on front or rear vehicle windows, dark bumpers, side panels etc. This sticker is only five bucks, (or free for members). New edition just released and in stock at the ExplorOz shop now.